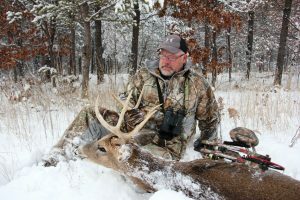 Late season deer hunting is often characterized by harsh conditions. 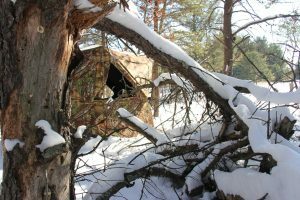 Ground blinds are the perfect solution in so many ways. My son Dawson sat close beside me as we watched two does feed out into the hayfield 40 yards out of range. Dawson was 12 years old and in his hand was the bow he had practiced with for hours all summer. In his pocket was his very first archery deer tag. He so wanted to cut a notch into it. I think I was as eager as he was. We had placed this blind in position on the edge of the alfalfa several weeks before. It took several days for the deer to get accustomed enough to the blind that they began to ignore it. When it came time to hunt the blind, we were both eager and ready. Soon movement to our left distracted our attention away from the does. A forkhorn buck stepped out of the pines and into the field at 15 yards. The buck noticed movement and tensed up as Dawson drew his bow, but it was too late. Those hours of practice paid off; 20 minutes later we were dragging his first buck to the truck. That was not my first experience with pop-up ground blinds and it certainly won’t be my last. I have used them at any time during the season, but lately, I have been relying on them more and more during the last few weeks of the bow season, when the cold wind cuts to the bone. Ground blinds not only protect you from the elements, but they conceal your movements and you can make them very comfortable. An extreme example of this involves the deer my wife Cheri arrowed from one just last December. Cheri has not hunted much, she has been too involved in raising five kids so I was the one who brings home the venison, but now our kids are older and she expressed an interest in shooting one of the deer that had been trudging through the snow to visit our food plot each evening. She had been shooting her bow during the summer and fall, so I readied the ground blind for her like I would for any queen who appreciates the finer things in life. The ground blind offered carpeted floor, a comfortable chair and a small table to place her book and other things she may need. A half hour before she would enter the blind, I walked out and started a small propane heater for her. That evening, I sat there beside her in relative comfort despite the near-zero temperatures and excitedly watched as she shot a nice doe to add to our freezer. Now, that’s hunting in style. Here’s the deal with ground blinds. Whitetails are freaked out by them. Some people do not get past that problem, but there are ways to deal with it. You have to give it time. When a big blob shows up right in their living room, whitetail deer take notice. While some animals don’t seem to be too bothered by the sudden appearance of a structure (mule deer and pronghorn for example, whitetails just don’t like it. 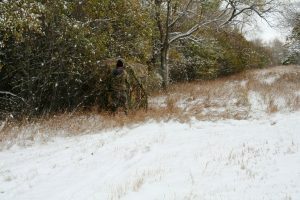 It takes the deer about a week to settle down and get fully comfortable moving about close to the blind, especially if it is out in the open. 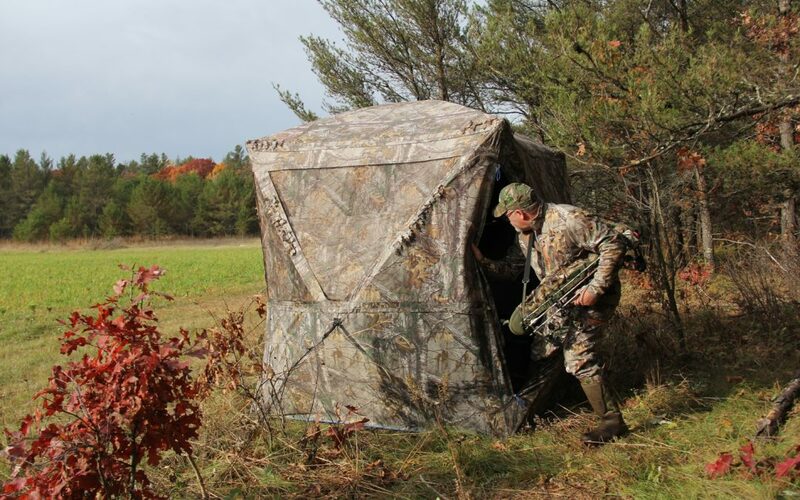 Put the blind out at least a couple weeks before you plan to hunt from it. Stake it down good to protect it from blowing away in a strong wind. I also take a piece of 2×4 lumber and block up the ceiling, otherwise it may collapse with a snowfall. Resist the temptation to hunt from the blind until the deer are casually moving about it, or you may have to start the wait all over. It really helps them accept the blind if you blend it is with natural materials from the area. Cornstalks, pine boughs and long-stemmed grasses work great for this. You can also use these objects to cover some of the black window openings that seem to make the deer uneasy. The best way I have found to help the deer accept the blind is to position it right neat some object that is already in position. A brushpile works excellent for this. In fact, I have at times piled brush near where I will eventually put a blind, so I can put the pop-up exactly where I want it when the time comes. Once the deer are moving or feeding around the blind, get there early and hunt it often. Wear black so you are well concealed within the blind. Only open the windows on the side you expect to shoot through, and do not open them any more than necessary. Too many open windows allow light to get into the blind and allow the deer’s amazing light gathering eyes to see you. Resist the temptation to open a window in the back so you can see behind you. The risk of having a deer see some silhouetted movement is too great. A small heater is not a bad idea to keep you comfortable in harsh conditions. A piece of carpet or a pallet can get your feet up off the frozen ground and an ozone generator will go a long ways towards limiting your scent and containing it within the blind. I have two blinds out right now and I will be hunting in one of them tonight. My confidence in them is very high, and if you use them properly in the late season, yours will be too.